We can heal our own bodies and the world by what we choose to eat, think and do. If you eat locally for your health, you will make a difference globally for everyone’s health. ATMOSPHERE: As much as possible, eat in an atmosphere of peace and an attitude of conscious gratitude. It is essential to sit down when you eat, so your system isn’t registering the ‘places to go people to see’ activation, which diverts blood to your limbs to get going. If you don’t have the time to sit, wait to eat. Pause before eating, and eat when you have calmed down and can communicate your gratitude to and for your body, and activated your intention that the food nourish every cell. Avoid processed foods. Most of the GMO foods are processed. No hydrogenated oil. No aspartame, MSG. No preservatives, artificial colors or flavors. No high fructose corn syrup. No soda. Definitely, no diet soda. If there are long words on the ingredient list, pass it by and buy something real that will support your farmers and your health. Drink pure water. Well water is best, followed by filtered, alkalinized, ionized water with a few drops of trace minerals, followed by filtered water alone. Avoid one-use plastic water bottles. Plastic molecules get into your body, and the Earth cannot handle the exponential growth of throwaway plastic bags, bottles and containers. As my son always reminds me, there is no AWAY. Bring your own healthy glass, stainless steel or # 7 plastic bottle (in that order of healthfulness) everywhere. Of course, no toxic Styrofoam. If they serve it in styrofoam, go somewhere else. and tell them why you are taking your business elsewhere. QUALITY OF YOUR WATER AND FOOD: fresh, local, organic food, preferably grown and produced within 50 miles of your home, from your own farmer’s markets. Now is the time to build your family’s own safe, secure local food and water source. 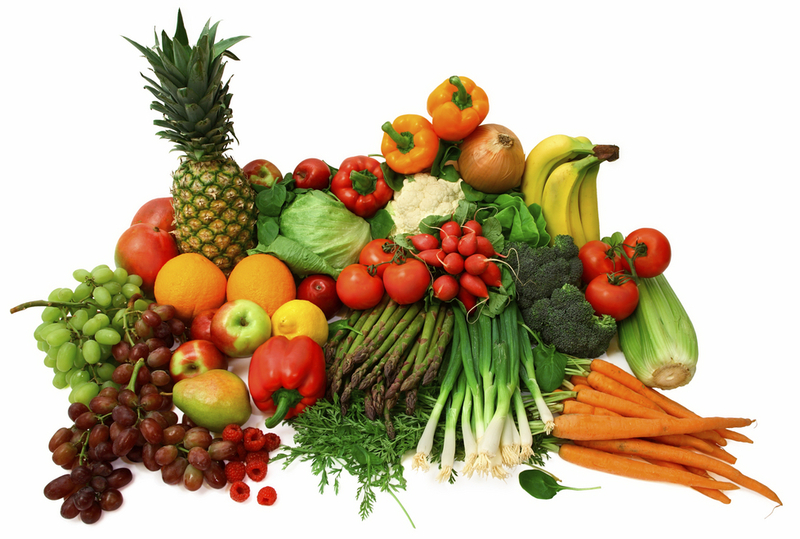 Eating vegetables picked freshly from your own garden gives you maximum vitamin and enzyme content. Second best is supporting your local farmer's markets, which is the biggest, easiest revolution there is for healing the earth's natural systems. Read The pH Miracle to understand that disease happens primarily in an acidic system. White sugar (considered a drug by nutritionists in the know) and meat are extremely acidic. BASICS: Simplify what you eat to ease digestion and elimination. Drink before eating, not after. Avoid ice water or iced drinks especially during or after a meal, especially if you eat meat, which takes many, many hours to digest (with exceptions of course). Eat fruit first (alone) and wait 15 to 20 minutes before eating other food groups. Eat either protein and vegetables, or carbs and vegetables. No red meat. If you eat meat, it is safest and best if it is local, fresh, only grass fed, and raised without artificial hormones. Ideally the source is a local, humane small scale operation so the energy is beneficial to your body. Massive feedlot operations and long distance shipping of meats is a major contributor of air pollution and global climate change. With exceptions, I have stopped eating tuna and other high-on-the-food-chain fish due to high heavy metal content increasing up the food chain. FRESH FRUIT/VEGETABLE JUICES: There is nothing like live vegetable juices to give our bodies a quickly absorbed (15 minutes) major dose of vitamins, minerals and enzymes that is absorbed about 3 times more effectively than food, due to its highly digestible form, our inefficient quick chewing and fast life style. Drink immediately after juicing while it is still alive ~ a powerful afternoon energy boost. Great one is carrot, cucumber, celery, beet, tomato and kale. Lemon and ginger are great add-ins. Add fresh kale, chard, spinach or other sweet, dark leafy greens to every smoothie you make. Many consider the morning prime time for a green smoothie. Nothing improves your health and vigor more than green drinks. Try this recipe: Organic cucumber, celery, apple, frozen bananas, papaya, spinach or kale, (or any combinatin of organic local fruits and greens). Salt and fat have been demonized in our culture. We need both. cold water fishes are great for our bodies… essential fatty acids. We crave them because we really need them. Excessive meat, hydrogenated oils and commercial fried foods are awful for our bodies. We need mineral rich natural sea salt to be healthy. Tibetan salt is amazing, as is Hawaiian Alaea (red Earth) salt. Real salt is essential for strong bones, balancing blood sugar, blood pressure regulation, the transport of nutrients in and out of your cells, mineral stores and electrolyte balance. and has about 16% essential trace minerals and some major minerals, including calcium and magnesium. Table salt has been heated to 1200 degrees and is 2.5% additives, including bleach and chemical flow agents. Table salt is toxic to the body. Read more about salt. When needed for difficulty sleeping or traveling in different time zones, try NIGHT REST, amazingly effective natural sleeping aid with melatonin. For people with sleep difficulties the combination of this with the Ca+ Magnesium, a whole food vitamin supplement, a hot nutmeg drink and deep rhythmic breathing work extremely well, transforming their lives. Half of all Americans are sleep deprived, causing irritability, trouble within the family, accidents and daytime drowsiness. FOR YOUR EYES: Take Solaray with LUTEIN Advanced or VIZION or Dr. Balch’s Eye support for vision fitness. I take this several times a week and highly recommend vision supplements unless you are a very active organic gardener eating lots and lots of dark green and yellow and orange and yellow vegetables and a big serving of berries 7 days a week. CELL FOOD: place 8 drops in your water once or twice a day for overall health and cellular resilience and oxygenation. Tastes like lemon water and is a very special product. An excellent joint supplement called Regenicare greatly enhanced my spinal healing, and was recommended to me by the Rhody Edwards DC in Kona, and it is excellent for people with serious joint issues. It’s a good tasting drink you can mix with ginger or fruity tea with a spoonful of their Metagreens. (Rhody says this is the finest green supplement on the market.) After doing this every single day for months, I did not need it anymore! Ageless Xtra, a delicious concentrate (1/2 oz to 1 oz in a large wine glass of water is equal to the antioxidant power in 10 portions of fruits and vegetables) for graceful aging and joint health. A healthful alternative to an evening glass of wine, drink it in a fine wine glass with a toast to your health. JUICE PLUS is also excellent. WELLNESS FORMULA if you feel you are getting sick… it’s a second immune system ~ amazing. Sonne 7 Liquid Bentonite Clay can uptake more than 40 times its weight in toxins from your gastrointestinal track. I take a tablespoon every morning when I am doing cleanses. It’s good to take for a few days a month. Take a daily high fiber mix if you have challenges with regular elimination. Finely grind all ingredients in your coffee grinder and sift. Fenugreek and fennel are hard and must be even more finely ground. Mix all of them together in a bowl and store in the freezer. Mix three tablespoons (start with 1 teaspoon and build up SLOWLY) with 8 ounces of filtered water first thing in the morning. I drink hot water before and during yoga and take the fiber after practice. Drink fiber immediately with a full glass of water. Keep adding more water and drink water afterward with one Milk Thistle capsule. Milk Thistle is your liver’s best friend and goes well with all other medicines and vitamins. See Calley’s Instar Yoga DVD and booklet for more information. DRY BRUSHING: As a daily lymphatic tonic brush your skin before showering. See VITAL CHI SKIN -BRUSHING SYSTEM by Dr. Bruce Berkowsky. His quick start program is a very scientific approach. Bring to a boil, cover and simmer for 21 minutes. Wrap tightly in a heavy wool blanket, and set overnight. This porridge will be cooked in the morning. Just add more milk, reheat, and serve with lots of yummy toppings. Rainbow Light One a Day for Women or Men each night, or at least several times each week. ESSENTIAL!!! For both women and men. Rainbow Light Ca+ MAGNESIUM (this is the only CaMag I have seen with 1000 Ca and 1000 Magnesium with digestive aids and synergistic herbs, such as betaine. Take 3 at dinnertime or with a hot drink before bed. I like to take 1, 2 or 3 (I vary all supplements.) with hot almond milk with fresh nutmeg at night. Magnesium is the most important mineral in every cell in our bodies and our soils are magnesium depleted. Almost everyone is significantly magnesium deficient. This product will deepen your sleep and increase your body’s ability to rejuvenate your nervous system and muscular system all night long. It's essential for healing muscular spasms, restless leg syndrome, high blood pressure, nervous disorders and tightness. This is your new best friend. Also, FLORADIX liquid magnesium, which I don’t often buy, as I seek to buy products manufactured in the US and this comes all the way from Switzerland.